Every summer season (October to April), between our iconic red and yellow flags on beaches up and down our vast WA coastline, you can find our surf lifesavers and lifeguards. Between those flags, we draw a line in the sand: everyone who crosses it should enter and leave the water safely. The Surf Life Saving movement in Australia originated in 1907 when volunteer lifesavers began to protect the lives of fellow beachgoers on New South Wales’ Bondi Beach, by performing patrols and rescues. In Western Australia, Surf Life Saving has its origins at Cottesloe beach, where the first WA Surf Life Saving Club was formed in 1909. Since these humble beginnings, volunteer lifesavers have saved more than 600,000 lives. Lifesaving has changed dramatically over the past 100 years, with over 310 Surf Life Saving Clubs around Australia now in operation, including 30 in Western Australia. Today, in Western Australia alone, more than 5000 trained volunteer surf lifesavers commit their weekends and public holidays to patrolling our coastline to keep beachgoers safe. This accounts for more than 100,000 hours a year. It’s easy to see how our people know the beach best! Lifesavers wear easily identified red and yellow uniforms with SURF RESCUE clearly written on the front and back of the shirt. Next time you are at the beach, find the red and yellow flags and always swim between them. Remember, if our lifesavers can’t see you, they can’t save you. Nationally, Surf Life Saving is one of the largest providers of paid lifeguards in the world. 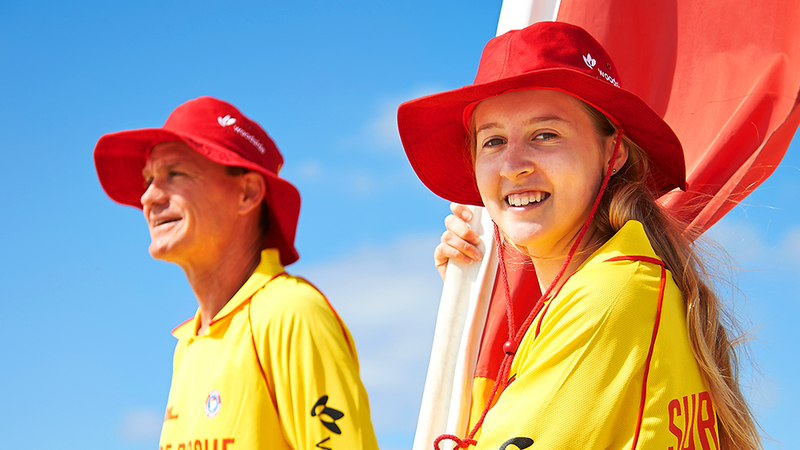 Under the banner of the Australian Lifeguard Service, Surf Life Saving employs over 700 lifeguards at more than 250 locations across Australia. In WA, SLSWA is the largest provider of paid lifeguard services, managed under contract for local or state government agencies, from Middleton Beach in Albany to Cable Beach in Broome. Lifeguard Service employees wear red and yellow uniforms with LIFEGUARD written clearly on the back and front of the shirt. In Australia, many local councils also run their own professional ocean lifeguard service. These lifeguards wear a range of different coloured uniforms, including variations of blue, white, red and yellow.